This listing is for a. OSP 20 Space Studio Rack Case. The OSP ATA studio rack cases are perfect for recording studios or any project that requires a permanent installment. The OSP studio cases are a ATA type case made with 3/8 marine plywood with black laminate, tongue & groove metal railing, industrial rivets, front and back pre-tapped rack rails and rubber feet. Fits any standard 19 rack mountable gear. 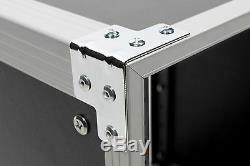 Comes with a free bag of rack screws and washers for rack mounting your audio gear. This case is 18" deep from front edge to back edge, rack rail are recessed 1" from edge. From front rack rail to back edge is 17. The video link below is just to show you the quality of OSP studio Case. The size is Not the same as this listing. The video link below is just to show you how to assemble the OSP studio cases. Tongue & Groove Metal Railing. Rubber Feet for Easy Stacking. Quick and easy assembly is required. Small bag of rack screws and washers. 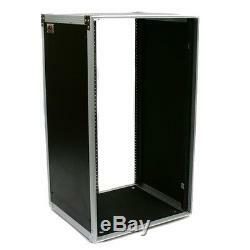 1 Rack Space Unit is (1.75") or (1 3/4") inches tall. Heavy-Duty Pre-Tapped (Threaded) Rack Rails. Front & Rear Rack Rails (recessed 1 inch from ea edge). Rack Rails are 19" wide and 16" apart front-back. Rack Rails are 35 inches tall. Outside Dimensions Including Rubber feet. 21" W x 37" H x 18 D.
The video below is to show the quality of the OSP Studio Cases only. Jade Music Store is required by state law. Defective free or damage free. Link on this page for more details. The item "OSP 20 Space Studio Rack Case Fits 19 wide Rack Units Gear equipment TAC20U-18" is in sale since Wednesday, January 10, 2018. This item is in the category "Musical Instruments & Gear\Pro Audio Equipment\Cases, Racks & Bags".